If music be the food of love, play on. Whenever we’re ill or feeling a bit sorry for ourselves, having the radio on in the bedroom is a lovely bit of company and perks us up no end. Which is handy, as a few of us have been down with the dreaded flu this new year. Yes, the proper, bed bound with hot and cold sweats version. Not nice. We hope you’re OK and keeping healthy while this nasty virus does the rounds. Have you invested in a DAB radio to keep you company on these miserable winter mornings? We’ve popped the Denver DAB-40 in black and white monochrome on our bedside table for just that reason. 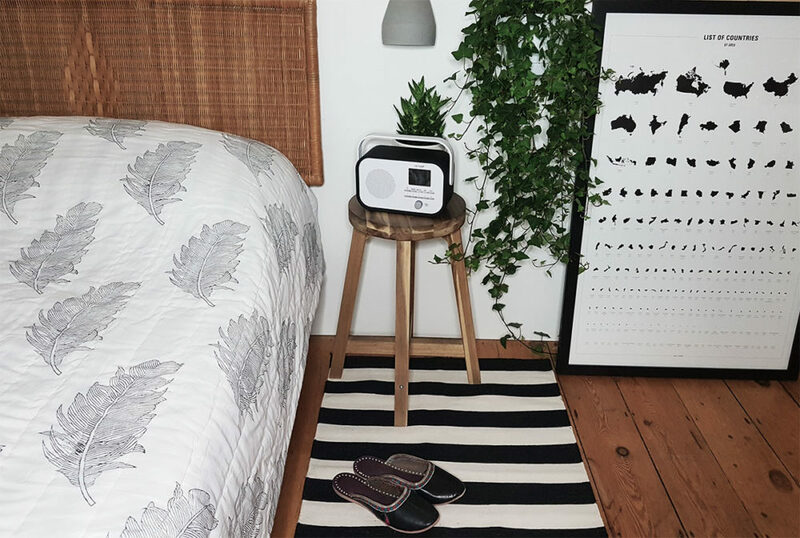 These sleek, contemporary DAB+ radio alarm clocks from our Danish supplier come in grey and white also, are only £39.99 +P&P and give us the musical love we need this winter. Find your favourite radio stations at the touch of a button! The auto scan will search and automatically save all available DAB channels, or you can scan manually if you prefer. Switch to FM to find all available FM stations. Preset your favourite channels in both DAB and FM modes, to save searching through the complete list each time. Look, listen and learn! This fantastic feature enables you to bring radio news and information to life through visual display. The colour screen also displays the time, as well as the DAB and FM radio stations when searching and listening. The built-in 24 alarm clock gives you peace of mind that you’ll never be late again! If those around you are seeking some peace and quiet, plug in your headphones and listen in private (headphones not included). The DAB-40 is totally portable, with the option to power through the mains or by battery (batteries not included). It’s a great little bedside helper!